Today is the 10th birthday for Knife Rights. We owe a debt of gratitude to Doug Ritter for taking the initiative to form the organization. The post below tells about the article that inspired him to take action and the successes that they have had over the last 10 years. Ian from Forgotten Weapons blog goes old school at this run and gun steel match in Arizona. Who am I kidding. Ian always goes old school! The 1907 was used by the Austro-Hungarian cavalry, and is in my opinion one of the best pistols of World War I. It is a solid and durable design firing a reasonably powerful cartridge (for the time, at least - 8mm Steyr is a 113gr projectile at about 1070fps) and with reasonable sights and good handling. 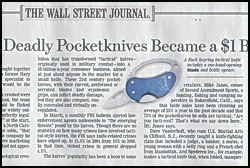 It is mechanically innovative, with a firing mechanism functionally identical to today's "safe-action" systems. The striker is halfway cocked by the action of the gun cycling, and the remaining half is done by the trigger press. The 1907 uses a proprietary stripper clip holding 10 rounds, with a movable follower built in. Pressing down on the clip's follower puts an even pressure on the cartridges, helping to make it a very smooth design to use - I would rate it as equal or better than any other type of stripper clip I have used. Even with an antique gun using an antique cartridge Ian still comes in 17th out of 21. Considering he was using stripper clips to reload and not magazines, that is pretty damn good. I don't push the affiliate links that much. However, I would like to remind you that all (as in 100%) commissions earned are donated to gun rights organizations such as the Second Amendment Foundation, the NRA Civil Rights Defense Fund, Grass Roots North Carolina, and others. If you have a favorite non-profit gun rights group that you'd like me to consider supporting, let me know in the comments section. Today is Amazon Prime Day with special offers throughout the day for members of Amazon Prime. I use Amazon Prime and like it. It's nice ordering something and having it here in a couple of days. Just as nice are the movies and videos that are available through it such as the the original TV run of Firefly, all six seasons of Justified, the Amazon Originals like The Man in the High Castle, and much more. You can also pick up an 8 GB Kindle Fire Tablet for $33.33. Think of it as a mini iPad that costs a whole lot less. You can click on the banner below if you are an Amazon Prime member and be linked to the deals. If you aren't a member, click where it says "free trial" which will get you the deals and a month to try it out. For every person who is not already a member of Amazon Prime who does try it out, that means $3 will go to support our Second Amendment rights. Think about that. The media has been trying to use the shooting of Philandro Castile in Minnesota as a wedge between the African-American community and the National Rifle Association. They are saying that the NRA doesn't care about black gun owners. Moreover, as this article in Inquisitr makes clear, they continue to try and make this a wedge issue because in the NRA's call for an investigation in Minnesota they did not mention Mr. Castile by name. They are saying the NRA is facing an internal split. I don't see it. Colion Noir calls out the media and commentators who pushing the meme that the NRA doesn't care about black gun owners. He notes that just like Philandro Castile he is a 32 year old black man with a carry permit that was stopped for a traffic infraction just two weeks ago. Colion Noir is usually somewhat laid back and cool. Here he is not. He's angry and he's tired of putting up with the crap that the media and other critics have spewed towards him personally and to the NRA. Miguel at Gun Free Zone pointed out this Facebook post from the Law Center to Prevent Gun Violence (sic) from just soon after the murders in Dallas. As Miguel said on Facebook, even vultures will wait before they start feeding on the corpses. I downloaded this screenshot at about 8:30am EDT. That means it was posted somewhere around 11:30 EDT last night. According to a timeline of the attack in Dallas, the first reports of gunfire was around 9pm CDT or 10pm EDT. Thus, within two hours of the first notice of the attack, the posting below appeared on the Law Center's Facebook page. Notice that it is gun laws that are being blamed. The top commenters are also blaming the NRA and, believe it or not, libertarians and the Koch brothers. The lone exception of the one suspect killed by the bomb squad who justified the attack as retribution for the deaths of Alton Sterling and Philandro Castile. Other than that, we just don't know because the details have not been made public. This, however, did not stop LCPGV aka LCAV from making the post below. 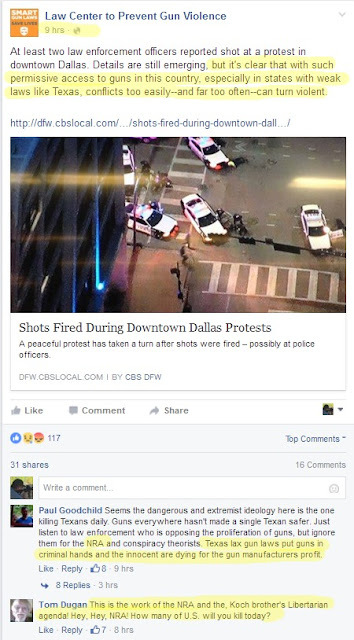 If you want to keep informed about really what is going on with the investigation in Dallas, I suggest the Dallas News. They are not the cable news stations bringing in "experts". They are the local folks on the ground who work the police beat. I received a press release yesterday from the Pride Fund to End Gun Violence (sic). From what I can gather it is a new LGBTQ group that has jumped aboard the gun control bandwagon and is setting up a political action committee (PAC) to support candidates who support gun control. WASHINGTON, D.C. – In response to the nation’s worst mass shooting in history and stalled efforts in Congress to implement gun reform, members of the LGBTQ community today announced the formation of the Pride Fund to End Gun Violence (Pride Fund). This political action committee (PAC) will support federal candidates who will act on sensible gun policy reforms and champion LGBTQ equality. In the first few days of fundraising, the organization has raised nearly $20,000. Pride Fund plans to have a strong impact in November and is well on its way to raising its initial goal of $500,000 for this election cycle. “The Orlando massacre was yet another senseless act of gun violence in America and the LGBTQ community and our allies are united in the call for action on commonsense gun reforms. We are tired of Congress’ inaction, so we are adding the strength and organization of the LGBTQ community to help end gun violence,”said Jason Lindsay, Pride Fund founder and executive director. Lindsay is a seasoned political operative with 12 years of experience working in politics, government and campaigns. He also served for 14 years in the U.S. Army Reserve and was deployed to Iraq in 2003. During the 2016 election cycle, and beyond, Pride Fund will actively support candidates at the national level who are willing to take on the gun lobby. The safety of our community depends on electing LGBTQ-supportive candidates who will also vote for gun reform measures. Campaign to ensure victory in November 2016 and beyond. 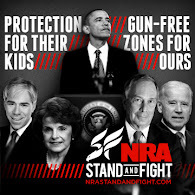 “This is a call-to-action for all Americans to stand up and take political action to end gun violence. Pride Fund gives the LGBTQ community and its allies a strong, concentrated voice to fight back against politicians who are unwilling to act on this important issue. While it will take strong citizen action, fundraising and political muscle to take on the robust financial power of the gun lobby – the LGBTQ community, with the help of its allies, has succeeded before and we plan to do so again,” Lindsay said. Pride Fund seeks grassroots engagement and donations that will allow our community to meet its goals. Each year, the gun lobby spends tens of millions of dollars to influence Congressional elections and legislative action. Pride Fund gives our community a unique voice to fight back by supporting candidates who champion diversity, equality, and – most of all – sensible gun reforms. Coming on the heels of the fantastic work that Erin Palette has done with her Operation Blazing Sword and the growth in membership of the Pink Pistols, I find it sad. This is because the LBGTQ community has long been the target of violence due to their sexual orientations. Rather than promoting self-reliance and advocating for the right of self-defense, this organization is actively seeking to remove the one tool that gives the equality of strength. A firearm, properly used, makes a 110 lb. lesbian equal in stopping power to a 220 lb. man who objects to her sexual orientation. A quick note on Jason Lindsay. According to LinkedIn, Mr. Lindsay is a long-time Democrat operative having worked as a field organizer for Hillary Clinton for President, a staffer for former Sen. Kay Hagan (D-NC), and former Rep. Brad Miller (D-NC). He parlayed that experience into a job as a Congressional Relations Officer with the Department of Veterans Affairs where he has worked since 2011. I am presuming that he hasn't updated his LinkedIn page to reflect that he has left Veterans Affairs to run this PAC. One has to wonder if Mr. Lindsay has, in the immortal words of George Washington Plunkitt of Tammany Hall, "seen my opportunities and I took them." What makes Mr. Lindsay's efforts even sadder is that he himself is an Army veteran having served in Operation Iraqi Freedom and is a former Army Reservist. I don't care if he was a REMF while serving in Iraq but, at the very least, he should understand the role of armed self-defense given his military service. If you live in California or merely are a shooter visiting the state, you will want to watch the following futuristic video. If you think this could only happen in California, think again. I had a similar experience in O'Fallon, Illinois many years ago when visiting Ron-Jo's Gun Store. I saw some .30-06 ammo in M1 Garand stripper clips at a decent price. When I went to buy it I was asked for my FOID card. I was told that I needed either that that or a non-resident Illinois hunting license to purchase ammunition. Needless to say but I went away disappointed and without any ammunition. It was also the first time I had even heard of a FOID or Firearms Owner Identification card. The Law Center Against Gun Violence (sic) helped draft this ballot initiative for Lt. Gov. Gavin Newsom. Their push for gun control may seem idiotic but they do have access to very good attorneys who can draft initiatives like this with no wiggle room. Let's put it this way - they are smart enough to realize that without ammunition, a firearm is merely an expensive piece of metal (and wood and plastic). I see this initiative as another move by the elites to keep the masses under their thumb. The elites will always have their own armed guards and police forces. Without a means to self-defense, the masses will become even more dependent upon a government controlled by the elites for protection. Protection that as we have been told by the Supreme Court they are not required to provide. From behind occupied lines, Radio Free California has started broadcasting. If you remember, the Firearms Policy Coalition recently won a restraining order against California AG Kamala Harris and the State of California regarding the use of video from the Calfornia Assembly and Senate. It looks like they are starting to make use of it. House Majority Leader Kevin McCarthy (R-CA) introduced HR 5611, the Homeland Safety and Security Act of 2016, on Friday, July 1st. This bill is an amalgam of items that are supposed to protect us from the Islamofascists. The findings in Sec. 2 of the bill explicitly mentions ISIS and al Qaeda. I seem to remember it was not so long ago - like a week earlier - that Speaker Ryan said the Democratic sit-in was nothing more than a publicity stunt and that the Constitution must be defended. He went to say that they wouldn't take away a person's guaranteed rights without due process. agencies concerning the identity of the prospective transferee. the docket of that court. opportunity to participate with counsel. attempted to commit an act of terrorism. Sec. 5 is a variant of the Cornyn Amendment (S. Amdt. 4749) which failed to secure enough votes in the Senate on a cloture motion. Knowing that there are not enough Senators who would vote in favor of a cloture motion on this bill, isn't this just as much a publicity stunt as the sit-in by the Democrats? Clearly not as visually pleasing to the media as the sit-in, it is still a stunt as it allows the Republican leadership to say, "We did something!". While Sec. 5 marginally protects due process, lawyers are expensive and there is no guarantee of winning so as to recoup your legal expenses. Moreover, what is to say that someone like Mike Vanderboegh was not put on the list as a domestic terrorist for his Second Amendment activism at the recommendation of the BATFE, the BLM, or even the SPLC. Heck, for all we know it could be all gun rights bloggers, podcasters, or Facebook commenters just because Loretta Lynch doesn't like us. No one knows how, why, or if they are on the Terrorist Screening Database. There are thousands on the list because they have a similar name, a letter or number was transposed in the original report, or for any number of errors. There are also truly evil and dedicated terrorists on the list who may or may not be under surveillance by the FBI, DHS, or some other alphabet agency. Larry Keane of the NSSF pointed out late last year that under such a law all it would take to confirm to a terrorist that he or she was under suspicion was to try and buy a firearm. The NICS denial would be all the confirmation that they needed. HR 5611 has been sent to a number of House committees. That said, all indications are that it will be voted on sooner than later. I don't care if the NRA was marginally OK with the Cornyn Amendment or that Donald Trump thought it might be a good idea. I object to secret lists, I object to any attempt to abridge enumerated Constitutional rights, and I object to Sec. 5 of this bill. Call, email, fax, or write your House member and let them know that you oppose Sec. 5. As the Sultan Knish blog (thanks Kevin Baker for the link) said last year, you can't have a truce with the Left. If you think that the Mike Bloomberg's, Shannon Watts', or Ladd Everitt's of the gun control world are going to compromise with us, you need to think again. The gun prohibitionists in California thought they were sticking it to gun owners when they banned the "bullet button". The two bills signed on Friday by Gov. Jerry Brown (D-CA) which banned the "bullet button", AB 1135 and SB 880, have very similar language. The laws said that to be exempt from consideration as an "assault weapon" the firearm must have a fixed magazine. Darin Prince, the inventor of the original Bullet Button, responded with something that will drive the gun prohibitionists nuts because it fits within the letter of the law yet allows you to replace a magazine very quickly. It may not be as quick as what I can do in a free state but it seems every bit as quick as a "bullet button". The North Carolina Wildlife Resources Commission has announced that no license or trout stamp will be needed to fish in the state on Independence Day, July 4th. This will apply to both residents and non-residents. This is a great opportunity to take your kids fishing without having to pay for a license. Of course, buying a license does support the conservation of fish, game, and habitat in North Carolina. To all my Canadian friends and acquaintances in the 51st state, Happy Dominion Day! Growing up July 1st was always Dominion Day and not Canada Day. It was not until 1982 that the name was switched and then it was only done on a late Friday afternoon under the earlier Trudeau's government. You can read the whole sordid tale of that here.